It is Saturday. I sit on a bench in the garden, just after dinner. Lush trees surround me. The creek below flows freely. The cool breeze blows as the warm sun begins to set. Everything that surrounds me is full, ripe with goodness, extending up and out. The trees’ branches exhibit a fullness of green. The shining sun just celebrated its brightest day of the year. The gentle breeze rustles the grass and tickles my nose. And the colorful flowers cheerfully greet everyone that comes their way. 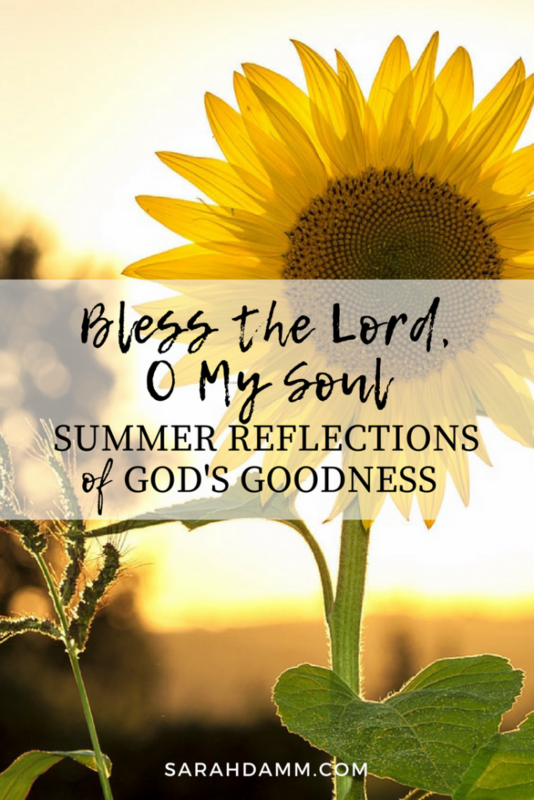 Summer is a glorious season to ponder the goodness of God’s creation. Even more so, it gives opportunity to ponder the goodness of the Creator, for all of creation demonstrates God’s lavishness, His generosity, His plans, and His purpose. As I sit in evening’s twilight, surrounded by God’s creation, I become very aware of God’s intentionality. Just like the psalmist expresses, God appoints … He makes … He forms … He causes … He provides … He gives … He renews. And in turn, all of creation receives from the giver of all that is good. We receive God’s goodness, His creativity, His generosity, His provision, His glory, His grace, and His love. Observing God’s creation, I am in awe of the very proper order and specific purpose of each and every thing in this world. I ponder the tree swaying in the breeze, doing exactly what it is meant to do. The sunflower opens up toward the sun as it is created to do. All of creation seems to praise the Lord in its natural element; all of it content (and grateful for) being what God designed it to be. An incredible peace washes over me. In this moment, life is breathing all around me, and life is breathing within me. It is just as God desires it to be. In this moment, I am me in my truest sense, because everything else—the distractions, worries, obstacles—fades into the background. As my thoughts turn inward, I acknowledge that I do not always feel peace quite so easily. And I wonder why. Am I exactly as God created me to be? Am I content at being me? Or do I take things into my own hands and try to be someone that I’m not? So often, I mistakenly try to do more than God requires. I misunderstand His invitation, and I get lost in another direction. I am anything but myself, and I end up feeling weary, burned out, and exhausted—any number of things but peaceful. Why? Because I am trying too hard to be someone that I’m just not meant to be. Perfectionism is a struggle for many, and it hinders us from being true to the unique creations God made us to be. As a result, we put on masks, cover up flaws, and slowly and steadily forget who we truly are. But God does not desire for us to be perfect. Rather, He wants us to be true to who He created us to be. Just as He created the tree to be a tree and the bird to be a bird, He created you to be you and me to be me. It really is that simple. As it happens, the times when I remember this, I am in one of two places: 1) the Adoration chapel or 2) somewhere in nature. What’s funny about that second place is that I’m not a particularly nature-loving person. But somehow God uses His creative provision to remind me to simply be me. It is as if God is whispering to me, “Just be you, Sarah. And let me love you as you are.” And in that moment, it is just me being me. And it is just God loving me for me. This summer evening, as God’s splendorous creation opens up to me and I am filled with peace, I am deeply aware of God’s purposefulness. His generosity, goodness, and love swirl around me. I am reminded of another specific summer day. As if it was yesterday, I am floating in the sea, basking in the sun, delighting in God’s goodness, overflowing with gratitude for His generosity. I hear my children’s laughter. I contemplate their presence, the miracle of their lives, and the love that brought them into being. In this moment to which I return, I recognize that these moments of contemplation are more real than “real life.” For in these moments, I receive a foretaste of the end for which I was created: Heaven. And in the fresh air of nature, the soft breeze on my face, the laughing babble of water, I soar and float and overflow with gratitude for the God who holds it all—who holds me—in His hand. Thank you, God, for being the author of life and all that is good. Thank you for moments of awareness. Thank you for memories that draw me back to You. I will sing your praises forever. I rejoice in You and the love and delight that You show me. I love You, Lord. How loved do I feel by You! What are some of your summer thoughts, prayers, and reflections? What is God showing you during this season of warmth, refreshment, and rest? This blog post was originally published at CatholicMom.com.